When the sun goes down and the stars come out at the Rock Creek Fairgrounds — the pristine setting for Ponderosa Music & Arts Festival — the vibes shift from blanket-layin’ and river-floatin’ to beat-droppin’ and booty-shakin’. 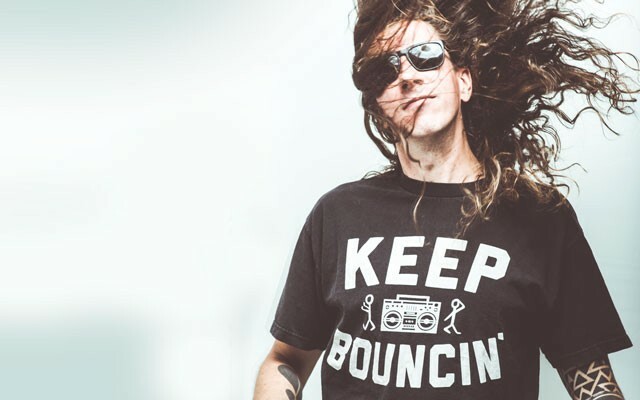 To take you on that magical journey on Ponderosa’s Saturday night, we’ve got the fresh and funkified tunes of west coast beat master and maker of reggae, drum’n’bass, and all beats of the sickest variety, Tyler Martens, aka Stickybuds. While you may be familiar with his brand of music, you may not be familiar with he’s tendency toward certain types of water accessories, woodland creatures, and the tunes he likes to pump on summer vacation when they’re not his own. Read on to learn more about Stickybuds in this installment of Ponderosa’s Summer Vacation Interrogation, and catch him live at Ponderosa 2016 on Saturday, August 20, at 12:20 am on the Pinecone Stage! Laurel Borrowman: How are you feeling about your first Ponderosa experience? Stickybuds: This will be my first time, really looking forward to it! LB: What bands are you most looking forward to seeing? Why’s that? SB: I’m actually not familiar with most of the lineup, so judging by the promo pictures and names, I’m most excited for Giraffe Aftermath, Buckman Coe, and the Boom Booms. SB: A beaver for sure. They are very resourceful and do whatever they want. LB: You’ve been camping recently! Tell us a bit about your adventures in the great outdoors. SB: I just went up to Mabel lake a few days ago for a night with some friends to get away from everything. I am a master fire poker and 6 am boat driver. SB: Ace of Base, Happy Nation (credit to my mom). For my dad, Garth Brooks. LB: Moonrise Kingdom, the Great Outdoors, Meatballs, or Addams Family Values (the one where Wednesday burns down Camp Chippewa)? Why? SB: Moonrise Kingdom is definitely a favorite. I’m a big Wes Anderson fan, but I think most people are. His movies are great. SB: Cannon balls. Way easier. SB: Noodle. It’s harder to hit your brother in the face with an inner tube. SB: I wear Molecule shorts and t-shirts pretty much every day of my life. I tour in Australia and New Zealand in our winter, so I get pretty close to having shorts weather year round. SB: 20Syl – Ongoing thing, or Seven Eleven. Or Stevie Wonder – Master Blaster (Jammin), but that’s every year.